Chronic obstructive pulmonary disease, or COPD, is a group of conditions that cause breathing difficulties and related problems. These conditions include emphysema and chronic bronchitis. People can live for many years with COPD, and treatment can help control symptoms. However, the illness remains the fourth leading cause of death in the United States. If you or a loved one has COPD, it’s important to know what to expect during COPD at the end of life—and what kind of help is available. The course of COPD is hard to predict, as it progresses at different rates in different people. The illness usually advances gradually, but it’s often punctuated by severe flare-ups—called exacerbations—that can lead to unexpected death. Shortness of breath while resting. 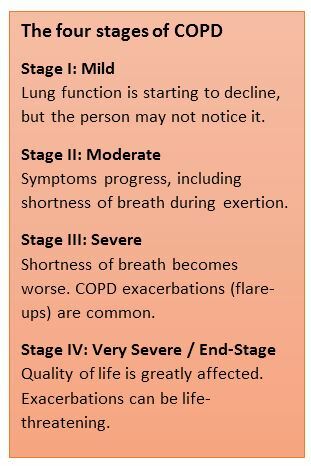 Although breathlessness can occur at each stage of COPD during physical activity, it happens even while resting during end-stage COPD. Limitations on activities. People have trouble walking, cooking, dressing, or doing other daily activities. Chronic respiratory failure. This is when your respiratory system can no longer expel carbon dioxide from your blood, or when it can no longer take in enough oxygen. Lung infections. Respiratory infections, such as flu and pneumonia, can worsen COPD. More trips to the hospital. This includes emergency room visits and overnight hospital stays. Anxiety and depression. Patients often become anxious and depressed as their condition worsens. Increased confusion or memory loss. This can be caused by lack of oxygen or too much carbon dioxide building up, emotional distress, or other factors. Delirium. The patient’s level of consciousness may change, and they may become restless or incoherent. Malnutrition. Patients may eat too little due to anxiety or depression, lack of energy, or lack of appetite caused by discomfort due to breathlessness. Other chronic diseases. 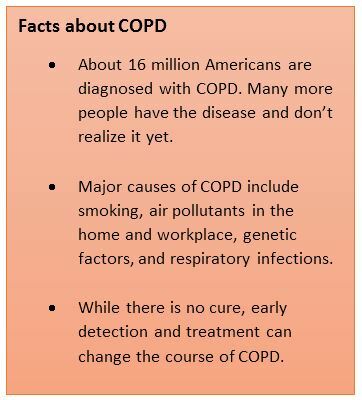 COPD is associated with other serious conditions including cancer, heart disease, diabetes, kidney disease, and stroke. It’s important to note that life expectancy is difficult to predict among COPD patients. Many factors can play a role, including a person’s smoking history, fitness level, nutrition status, and degree of breathlessness. If you live in South Jersey and have questions about end-stage COPD hospice care for your loved one, please call Samaritan at (800) 229-8183. Lung surgery or transplantation can benefit a small number of COPD patients. 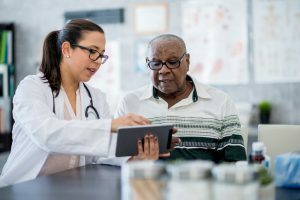 However, people with end-stage COPD often prefer to focus on improving their quality of life, rather than seeking invasive measures to prolong life. Treatment aimed at reducing symptoms and increasing comfort is known as palliative care. Palliative care can be given at any time during the course of COPD or other serious illness. It addresses the patient’s full range of needs: physical, social, psychological, and spiritual. Near the end of life, patients can receive hospice care—which is palliative care for people with a life expectancy of six months or less. Read about the benefits of hospice care at home. Short-acting and long-acting bronchodilators—a type of inhaled medication—can be used together to relieve shortness of breath during regular activities. Inhaled glucocorticoids. These medications can reduce airway and systemic inflammation caused by COPD. Opiates. Morphine, especially, can significantly relieve breathlessness. However, it may only benefit certain patients, and must be monitored carefully for side effects. Supplemental oxygen. This inhaled gas can reduce breathlessness in certain patients. Pulmonary rehabilitation. 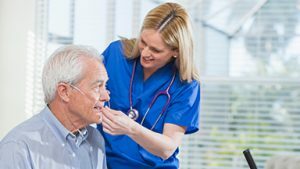 This program of education and exercises can benefit patients at all stages of COPD. Noninvasive positive pressure ventilation (NIPPV). This breathing support, given through a face mask or similar device, may improve breathlessness in some patients. Nutritional counseling. This can address malnutrition—a common complication of end-stage COPD that can hasten death. Psychological and social support. 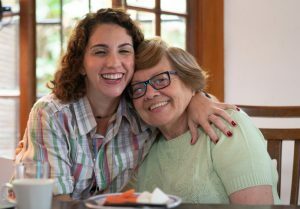 These important services can enhance the patient’s emotional well-being, address practical issues, and help with end-of-life concerns. Complementary therapies. Holistic services such as massage, music, and pet therapies can help calm symptoms such as shortness of breath. To learn more about these services at Samaritan, visit Hospice and Palliative Care Complementary Therapies. Non-pharmacological strategies. Regular exercise is one of the best ways to reduce COPD symptoms. When such activity is no longer possible, certain techniques can also reduce the feeling of breathlessness. These include the use of a fan, energy-conserving measures, breathing techniques, and relaxation methods. Financial and legal matters. Make sure their affairs are in order, including their will, medical and financial power of attorney designees and funeral and burial arrangement plans. Advance care plans. Help them create a living will and/or POLST (Practitioner Orders for Life-Sustaining Treatment) to provide instructions for their care at end of life should they become unable to communicate. Final wishes. Determine their preferences for their funeral, such as a special reading or music. Hospice care. If the person isn’t already on hospice, discuss the benefits. For example, hospice can reduce pain and increase comfort, enabling them to feel better during their remaining time. And hospice providers can help guide patients and families through this difficult period. For advice on how to have these discussions, visit End-of-Life Conversation Resources. Finally, one of the most important things that family and friends can do is to simply be there for their loved one. Sit with them and share memories. Listen to anything they want to tell you. Hold their hand, play music, or read to them—whatever brings comfort. If you can’t be there in person, call or video chat. Your time and attention are priceless gifts to those with COPD at the end of life.